Two distant alien planets around a dying star have been discoveredlocked in the closest orbital embrace ever seen, a new study has found. These two gasgiant planets are bound by their mutual gravitational attraction, and arecloser and tighter than any previously discovered set of planets. "This is the tightest system that?s ever beendiscovered, and we?re at a loss to explain why this happened," saidCaltech astronomer John Johnson, leader of the new study, in a statement. 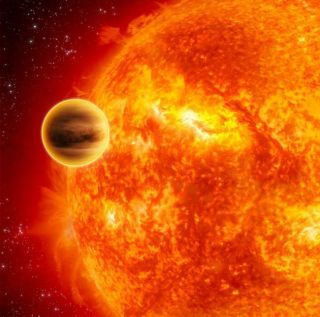 "This is the latest in a long line ofstrange discoveries about extrasolar planets, and it shows that exoplanetscontinuously have this ability to surprise us. Each time we think we canexplain them, something else comes along." The newly discovered pair is orbiting the massive dyingstar HD 200964, located roughly 223 light-years from Earth. In addition, the team also discovered two more extrasolarplanets also locked in a tight embrace around a different star. Both these planets, and the pair in the first set, are gas giantsmore massive than Jupiter. Like most exoplanets, they were discovered bymeasuring the wobble, or Doppler shift, in the light emitted by their parentstars as the planets orbit around them. Surprisingly, however, the members of each pair are locatedremarkably close to one another. For example, the distance between the planets orbiting HD200964 occasionally is just 0.35 astronomical units (AU) ? roughly 33 millionmiles (53 million km) ? comparable to the distance between Earth and Mars. The planets orbiting the second star ? 24 Sextanis located244 light-years from Earth ? are 0.75 AU apart, or about 70 million miles (112million km). By comparison, Jupiter and Saturn are never less than 330 millionmiles (531 million km) apart. And these two pairs of closely orbiting stars may be the tipof the cosmic iceberg. Hundreds more could exist around other massive stars. "Right now, we're monitoring 450 of these massivestars, and we are finding swarms of planets," Johnson said. "Aroundthese stars, we are seeing three to four times more planets out to a distanceof about 3 AU - the distance of our asteroid belt - than we see around mainsequence stars." Main sequence stars are stars in a certain portion of theirlifetime where they are fueled by burning hydrogen into helium. The sun iscurrently in its main sequence phase. Stellar mass has a huge influence on frequency of planetoccurrence, because the amount of raw material available to build planets scaleswith the mass of the star. Because of their large masses and close proximity, theexoplanet pairs exert a large gravitational force on each other. Thegravitational tug between HD 200964?s two planets, for example, is 3 milliontimes greater than the gravitational force between Earth and Mars, 700 timeslarger than that between the Earth and the moon, and four times larger than thepull of our sun on the Earth. And, unlike the gas giants in our own solar system, the newplanets are located comparatively close to their stars. The planets orbiting 24 Sextanis have orbital periods of 455days (1.25 Earth years) and 910 days (2.5 years), and the companions to HD200964 periods of 630 days (1.75 years) and 830 days (2.3 years). Jupiter, bycontrast, takes just under 12 Earth years to make one pass around the sun. The scientists aren't sure how the planets got in thesepeculiar, carefully balanced configurations. They suspect that they formed atdifferent locations and may have migrated into these positions. Eventually, perhaps 10 million or 100 million years fromnow, the stars HD 200964 and 24 Sextanis will become red giants. They willthrow off their outer atmospheres, swelling to the point where they couldengulf the inner planet of their dancing pair, and will throw off mass,changing the gravitational dynamics of their whole system. "The planets will then move out, and their orbits willbecome unstable," Johnson said. ?Most likely one of the planets will getflung out of the system completely," and the dance will end. The scientists report their discovery in a paper acceptedfor publication in the Astronomical Journal.